Hello folks, and welcome back. I apologise wholeheartedly for not keeping this site up to date, and promise to try and do better. The good news is we’ve been succesful in tendering for the Bottleneck site, and have emerged with a new 3 year contract. We’re hoping to add lots of new features to the already popular format, and I’ll be announcing these as the weeks progress.Also here are a few photos of things that have gone on over the years, which hopefully give a taste of the atmosphere and fun enjoyed by Bushy’s punters whether they’re into bikes or not .We are hugely flattered by the couple displaying the Bushy’s tattoo. The Guy Martin photos were expertly taken by Sam Bucknall. 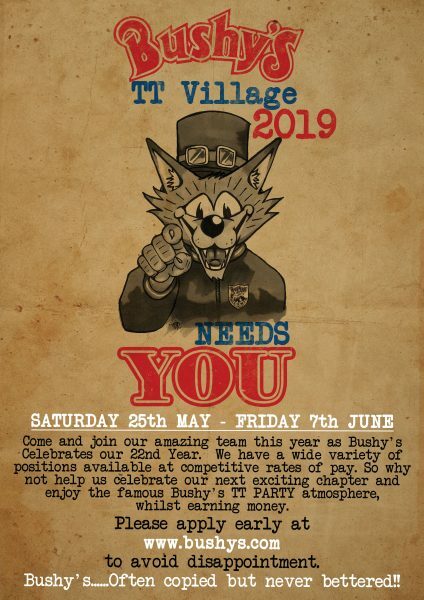 Looking forward to this years TT, especially as its also my stag do….bring on the Bushy’s for the dead rock star tour…!! !